who related the details later to me. was sweet but destructive. He barked and he farted. so I gated the roof for I am no one’s fool. but I’m also allergic so I cough and I sneeze. replaced all the chewed up books, beds and broom. no more invitations go out to the heedless! To be fair, this poem is an amalgam of several different housesitters, and I’ve had some good ones as well, so don’t be insulted if you were one of the good’uns!!! This entry was posted in dogs, humorous poem, humorous poetry, Humorous Rhymes, misbehaving dogs, Uncategorized and tagged Daily Post, Daily Prompt, hospitality, houseguests, housesitters, poem about housesitters on May 14, 2017 by lifelessons. Since Morrie is still being mean to her, Frida gets to continue sleeping in the main house. She should have a few privileges of age. We all should! She now likes her new bed and I think it will be more hair-resistant than her old bed that seemed more like a hair-receiver than a bed. The carpenter came today to measure for the shelves and storage bins for kibbles. They’ll have aluminum liners so the mice can’t get in–or the dogs!!! And, they have their own tiny fridge for opened tins of wet dog food and fresh bones, which the vet tells me I have to freeze for two weeks before giving them to them. Do you think the Taj Mahal got this much press when it was being built???? I tried removing the cages and just had their beds in the room, but they were so restless and that was when Morrie ate Frida’s bed, so I’ve put their beds back in cages and they seem much happier. I haven’t been shutting Diego’s door and he hasn’t reminded me to do so. He used to want it shut and locked. Morrie has learned how to open his cage door. Smart little trouble-maker!!! He’s even opened the side that has two locks instead of one. Let me know when you are sick of Doggie Domain (Bodoga) news. I don’t seem to be able to stop myself. I have a cool slide series showing the entire construction process but can’t figure out how to have the last pictures I want to add go on at the end and also I don’t know how to post a video or slides on WordPress. I just now learned how to find the Shortlink and how to post on Thursday Doors! Does the learning curve ever flatten out????? This entry was posted in dogs, misbehaving dogs, Morrie, photos of dogs, photos of houses, Uncategorized and tagged Bodoga, Diego, Doggie Domain, Dogs, Frida, Judy Dykstra-Brown Photos, Morrie on December 11, 2015 by lifelessons. Today they chose my suggestion for the daily prompt! It was: Return Address—Yesterday, your pet/baby/inanimate object could read your post. Today, they can write back (thanks for the suggestion, lifelessons!). Write a post from their point of view (or just pick any non-verbal creature/object). If you’d like to see the letter the below post answers, please go here. without the proper vocal chords, without your human hands? even though you’ve just admitted that our howls are luscious. And lacking proper fingers, we cannot write you letters. and yet you do not take the time to learn this doggy Braille! If you’d listen closer, perhaps you’d understand us. Instead you shout out, “Stop!” and “Hush!” and seek to countermand us. Can’t you understand that we’re protecting you from prowlers? Feral cats and owls and skunks and nearby canine howlers? We have such curiosity, though you determine to balk us. We wouldn’t have to rush the gate if you’d take time to walk us! We have to climb up on the roof to get a worldly view. 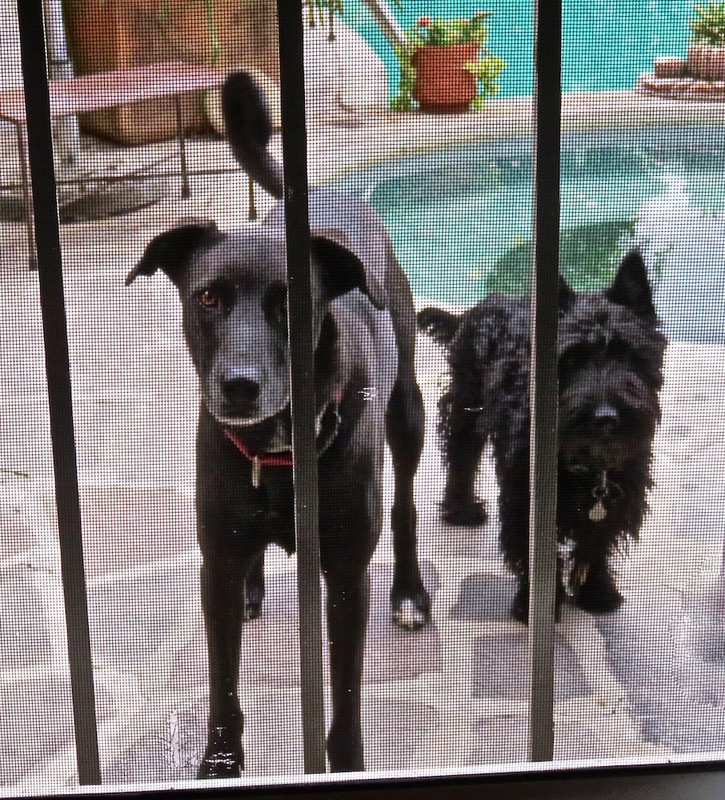 We wouldn’t be there barking if you’d take us out with you! Is ‘cause it’s smelly, wet and luscious. Dog food? We abhor it! That cat leaves a bit to tempt us—it’s a cruel feline game! So why not buy us cat food? It costs you just the same. Not only can our mom not cook, but now we make her itch! No wonder our neuroses include jostling for attention. A mother who can’t touch us? This escaped your earlier mention. We thought you didn’t like us so we tried to win your favor. Your touch is what we long for even more than cat food’s savor. sneak behind the garden shed to have our little poo. You seem to think we know these things, but where would we have learned? It’s you who should have taught us, for obedience must be earned. there is no other creature with whom we would rather be. This entry was posted in Cats & Dogs, Compulsions, Daily Life, Daily Post, Daily Prompt, dogs, Love Stories, misbehaving dogs, misbehaving pets, Poem, Poetry, Poetry by Prescription and tagged cats, Daily Post, Daily Prompt, Dogs, dogs and cats, Humor, humorous poetry, Judy Dykstra-Brown, Judy Dykstra-Brown Poetry, misbehaving dogs, poem, Poems, Poetry, Poetry by prescription, The Daily Post, Verse on November 7, 2014 by lifelessons.